The use of a single color, or range of shades in a color gives your home a sophisticated designer appeal. Do you have to hire a designer to achieve the look? No, you can do it yourself if you keep these things in mind. In other articles, we’ve talked about the difference between warm and cool undertones in the color palette. Warm undertones are in the yellow, red, orange and green family while cool undertones are in the blue and purple family. When designing in monochrome, your goal is to keep all the elements in the room (walls, flooring, furnishings) in the same color with the same undertone. To avoid creating a boring design, create visual interest with various textures. If the walls are smooth, add a textured carpet, nubby upholstery or three-dimensional artwork. Vary smooth glass tile with rougher natural stone, or a smooth floor with a wall-treatment or drapes that have folds, creases or other interesting surface characteristics. Use various light sources to define areas of interest, artwork, architectural details and exceptional furnishing. Add lamps and hanging light fixtures, hidden up or down lights, colored film on windows and even colored lights to change the mood or feel of the room. If white is your color and you want to evoke cool sophistication, add a single blue or sea-green vase or jade carving. In a taupe design, a warm, earthy rust or bronze adds interest. When decorating in grays, make sure to keep the theme warm or cool, but try adding a single element from the opposite undertone to make it pop, so if you’re using warm grays, add a simple cobalt blue as a focal point. For a more dramatic contrast, consider the always-elegant black and white. In the kitchen, matching cabinets, flooring, walls and ceiling may make the room seem larger—more open and airy. Simple contrasts in elongated cabinet hardware will pull the eye upward while horizontal wood grains move the eye from side to side. A monochrome bath adds a spa-like feel to a smaller room. Simplify the décor with striking greenery for an Asian-inspired vibe. 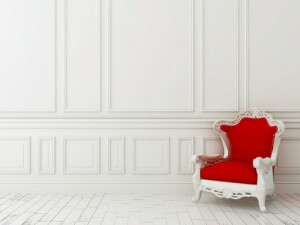 In a white-on-white theme, consider adding a contrasting paint color or bright wallpaper to a single wall. Use a monochrome theme to bring attention to a special architectural detail such as an original brick wall in your loft, or a natural-finished pine beadboard wall treatment for that Scandinavian feel. Whatever your ultimate choice, to narrow down your monochrome choices, peruse the Internet and magazines for examples that express the feel you’re looking for, then pick up samples of carpet, paint and fabric to experiment with textures. Make sure some are smooth, and try different lighting options with your samples to give you the best idea of what might work. Most of all … design your home to be comfortable to you, not some version of sophistication that doesn’t really work for your family.